The former minister said the accusation of fraud levelled against her by the party were laughable and alien to her character. According to her, members of the ACPN were frustrated with her because they assumed being a former minister, she would have money stashed away or would use her global network to raise money for the party. “One of the more laughable moments of the past week was hearing allegations that my presidential candidacy was a scheme to negotiate for a ministerial role. This is the height of political comedy, I must say,” she stated. 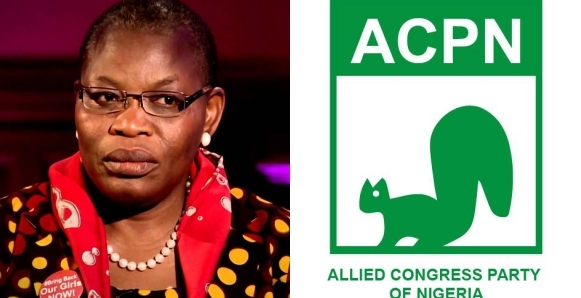 Ezekwesili disclosed further that her party card and other ACPN belongings in her possession have been returned to the party. She said she was concerned about the position of the Independent National Electoral Commission (INEC) that she cannot withdraw from the presidential race less than 45 days to the elections. She thanked her campaign team, noting that they would be getting some much-needed rest after the struggle. “Why would I then go through the pains of launching a presidential campaign to negotiate for a role I last occupied twelve years ago and have thrice rejected since after?” she questioned. Ezekwesili added, “Such mud-raking tactics is the reason why our best minds abstain from offering themselves up for political office thus leaving the worst of us to lead the rest. “More hilarious was the accusation that I raised and looted campaign donations. It is only morally bankrupt politics that can make anyone even imagine such accusation against me.